Academy Award winner Paweł Pawlikowski returns to the cinemas with Cold War. The film stars Joanna Kulig and Tomasz Kot as Zula and Wiktor respectively. Meeting at a music school, Zula a singer and Wiktor a piano player, it’s clear that the chemistry and love is there from the beginning. But life and the every changing world keeps them apart – can they find each other and be happily together? I’ll have to admit, on first watch and in a tired state, I didn’t exactly warm to Cold War in the way I should but unpacking it’s simplicity and how utterly fantastic the film is. The two lovers here are like Newton’s Cradle. There are magnets on either side of each other clashing at a random and erotically charges moments in their lives. They ripple against one another, reverberating through those around them and turning through different emotional turmoils that keep them forever separate. They bang, they click, they make motions; but they never completely meet and are soon swung away and out of reach from one another. It’s an excellent premise that, despite being seated in it’s simple charms, is developed with utmost passion. It helps that Kulig and Kot are perfect together. Though Kulig’s Zula threatens to teeter into Manic Pixie Dream Girl, her performance fleshes her out and makes her whole. Just a completely headstrong woman crossing different lines to wind up with the man she loves. Kot’s quite and unassuming Wiktor comes apart when Zula is around and it’s great to watch him change in this manner as the pair feed of one another’s souls and spirits. Drenched in the greys, the blacks, and the whites, there is sharp and attractive imagery that repeats and reverberates through their world. With Wiktor’s piano playing, silver jazz clubs in the night shine whilst snow-drenched streets of Eastern Europe make the world look pure despite the grim and dirty lives that occasionally our pair live with. The look is sleek and clean which makes the turbulence that much more impacting. The black and white colouring keeps this a mournful piece about the trials of love. 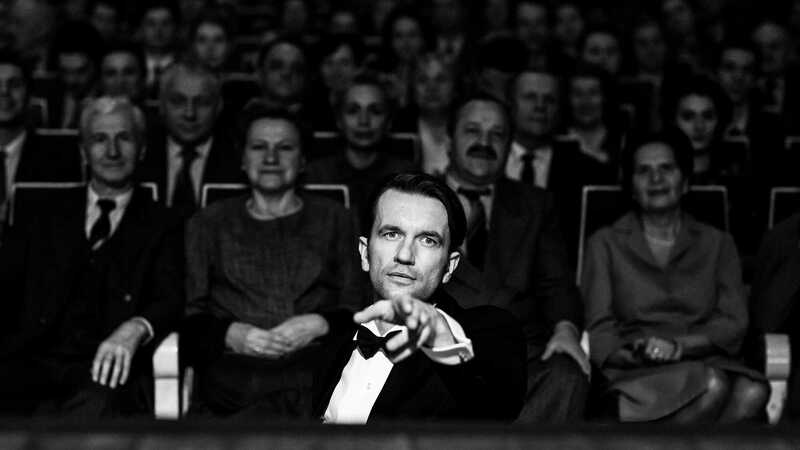 Pawlikowski keeps the backdrop steeped in the brutalities of the Cold War. A striking unfurling of a Stalin flag as a young adult choir is voiced to tribute him becomes a chilling moment of complicity whilst Wiktor’s own struggles with the frozen political landscape has terrible repercussions on his work and his relationship with Zula. It’s an affecting film that has a cool and crisp centric love and a smoke sweet look. A masterpiece of a love story, told through it’s beautiful, complicated, simplicity. On a final note, I have a slight obsession with mirror shots and this definitely has one of the best ones I’ve seen in a recent film. You know won Christmas day when you are awake at like five and you’re trying to keep quiet as to not wake the house. Yet the excitement is bursting within you and the minute your parents switch on the lights you bound down the stairs eager to tear into your amazing present and oh my gosh you have the bike you really wanted and it is shiny and it is great and it is golden and and and…. That’s exactly how BFI London Film Festival program launch feels. 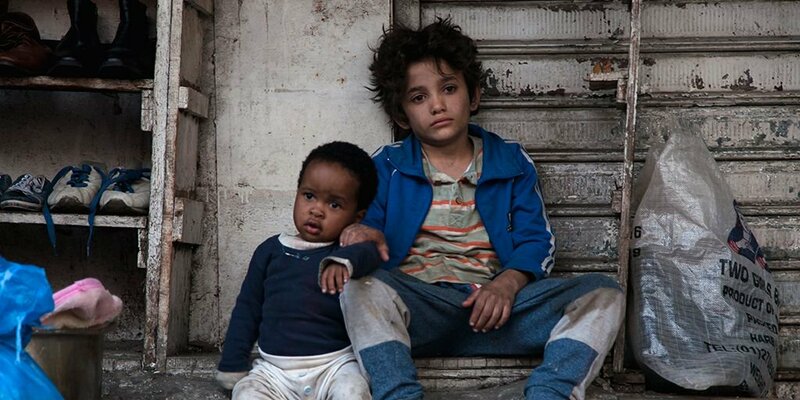 Of the Galas: Picturehouse Entertainment’s Capernaum leads the Debate Gala, Burning leads Thrill, Assassination Nation leads the Cult Gala, Love Gala is lead by Barry Jenkins’ If Beale Street Could Talk, Dare Gala is lead by Border whilst Mirai leads the family gala. BFI Flare strand is led by African film Rafiki and the Royal Bank of Canada Gala is Life Itself. The Mayor of London Gala sees Rosamund Pike star in drama A Private War whilst Melissa McCarthy’s Can You Ever Forgive Me is the Headline Gala. Chris Pine tackles Robert the Bruce another Headline Gala and the Mayfair Hotel’s Gala is The Front Runner with Hugh Jackman. BFI Patrons’ Gala is Keira Knightley led Colette and American Airlines Gala is the Coen Brothers’ The Ballad of Buster Scruggs. Another Headline Gala is Beautiful Boy. In competition there’s movies such as The Old Man & The Gun, Wildlife, Destroyer, Joy, and more and there is a whole variety of short films in place too. TV will be represented with presentations of Alfonso Curaon’s Roma and Park Chan-Wok’s The Little Drummer Girl. Other highlights include Carol Morley’s Out of Blue, Tom Harper’s Wild Rose, Peter Strickland’s In Fabric, and Georgia Paris’ Mari. We’re also particularly excited for The Kindergarten Teacher, Rose, The Raft, and more. This year will see 38% of the films made by female directors and will feature films from 77 countries. It’s a marvelous year for film! Look, there is so much here that we could fill streams of articles but it’s best if you pick up a a brochure or read it online. What do you think? BFI London Film Festival runs from 10 – 21 October! A Private War – Brand New Trailer! Rosamund Pyke is one of our favourite actresses and we’re terribly excited for her upcoming film. Based on a true story, this movie looks at brave war correspondence Marie Colvin. This looks to be a powerful biopic. What do you think? A Private War has no UK release date! Hunter Killer – Brand New Trailer! Here at Movies On Weekends, we love a good Gerard Butler farce and here’s a brand new one. Hunter Killer revolves around a submarine that has to race against time to help people. Look, it’s Butler putting on a serious face and saying dramatic things. We’re already sold. What do you think? When actors become directors, there are many ways in which they can go. OK. So, not many different ways, only two: Good or bad. Yikes. There are some who accomplish great works with their impressive movies such as Robert Mitchum’s The Night of the Hunter or Zac Braff’s The Garden State. Then there are a lot that just don’t seem to work out like Nicolas Cage’s Sonny orAngelina Jolie’s Unbroken. Anyway, it’s always tentative when an actor gets behind the camera. So how does Idris Elba’s directorial debut Yardie fare? The film is based on a book by Victor Headley and stars Aml Ameen as Dennis “D” Campbell. As a child, D’s brother is murder after preaching peace between two rival gangs. After growing up under one of the gang leaders Fox, D is now a drug runner and is determined to get revenge for his brother’s unlawful slaying. Sent to London to deliver a package of cocaine, D is shocked by the culture shift and the gangs of Hackney. Not only that, but his brother’s killer now resides in the city. Could D get retribution for his brother. More importantly, should he? Idris Elba’s work here is admirable. The director certainly has a particular visual style and captures a lot of beauty despite the grit. The scene in Jamaica are especially grand; bringing to life the lush greenery and gorgeous style of the country. Juxtaposed with London during the seventies, Elba does well to catch the period setting and diving into a thrilling and engaging film. That being said, the story, certain camera movements, and the crime elements show that he is dragging stereotypes from his blockbuster and action film background. It’s clear that his crime movie portfolio is making an impact in his work. This really degrades the film to a usual crime romp and wastes a lot of talent here. Aml Ameen, who rose to prominence in The Maze Runner, excels as D. The young actor is definitely one to look out for. He gets the gravitas of D’s grief as well as the nuance of changing cultures and moving country. Ameen gets into the meet of what would drive this character for revenge as well as keeping him haunted. He’s a charismatic actor who engulfs the screen with presence. Playing off equally brilliant newcomer Shantol Jackson as his childhood sweetheart Yvonne and old hand Stephen Graham as Rico, Ameen dominates with an excellent performance. Yardie is one of those films that shows a lot of promise but is sadly wasted on a quite dull plotline and action thriller tropes borrowed from better films that have come before it. 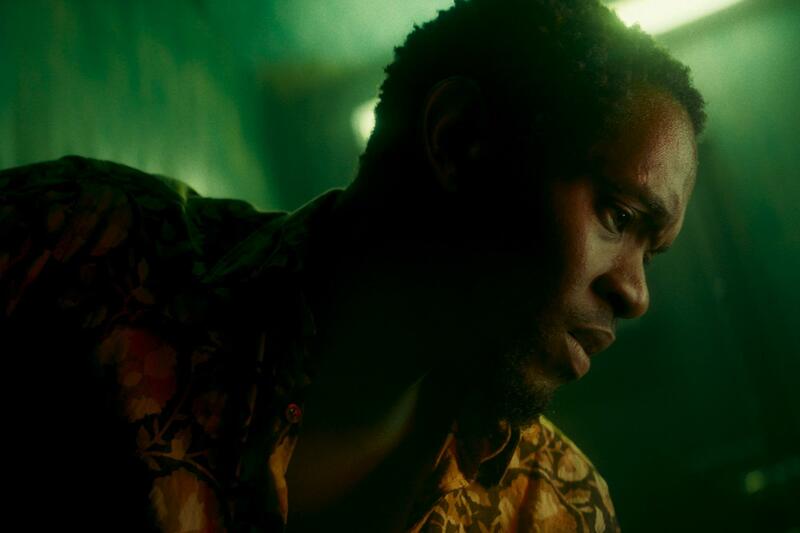 Yardie is definitely worth a watch – if not for Ameen’s superb performance but to see the beginning steps of Idris’ directing career. Hopefully next time, he takes his keen on onto something outside his wheelhouse and showcase something absolutely amazing. For now, and for all it’s faults, Yardie is an impressive debut. Ben is Back – Brand New Trailer! This is not the movie we were expecting with the first teaser. What looked to be an epic drama has turned into a proper thriller and we’re intrigued! Ben is Back basically revolves around a son returning home but could there be something more sinister going on. Starring Lucas Hedges and Julia Roberts, this is certainly an enticing treat. What do you think? Ben is Back has no official UK release date.